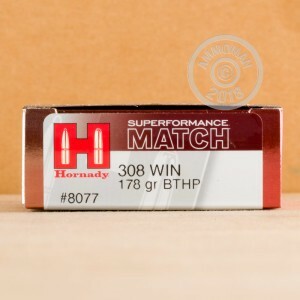 Hornady Superformance Match ammunition is engineered for superior muzzle velocity and incredible accuracy. 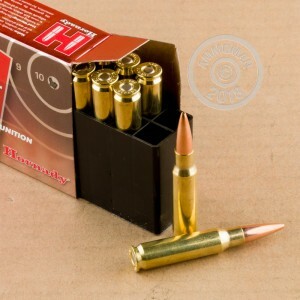 These cartridges for .308 Winchester rifles come in boxes of 20 and fire a 178 grain boat tailed hollow point bullet at a muzzle velocity of 2,775 feet per second. They're just what you need to emerge triumphant in a competitive setting. While all Hornady ammunition is made with careful attention to quality, Superformance Match ammo is designed to be the best of the best. Highly uniform cases and unerringly reliable primers contribute to consistent ballistics that bring out the best in a shooter's skillset. Training for a match? 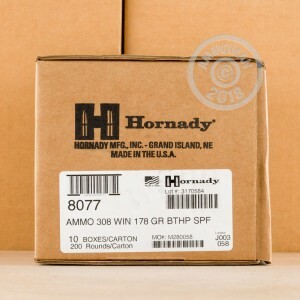 Keep your costs down (or plow the savings into more ammo) with free shipping from AmmoMan.com. Simply place an order over $99 to qualify!